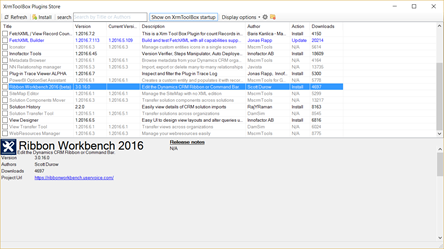 I'm pleased to announce that in addition to the managed solution that you can install inside Dynamics CRM, the Ribbon Workbench 2016 is also available in the XrmToolbox (if you hadn't already noticed!). When you open the XrmToolbox you will see that there is the Ribbon Workbench available for download in the plugin store. Keep checking out the store because tools are being added regularly by some great plugin authors. Thank you to all those who are helping to beta-test, I have been really encouraged by your comments and suggestions. The re-write of the Ribbon Workbench (to remove its dependency on Silverlight) and the XrmToolbox version has been on my 'to-do' list for much longer than I would have liked and so I'm particularly pleased with this release. The new Ribbon Workbench 2016 solution installs alongside the older version – so if you have an upgraded org you might get them all sitting there on your command bar. I'm keeping there on one of my organisations for posterity but you can safely uninstall older versions without losing any of your customisations.